Galerie Louise Leiris, Paris (no. 16460). S. Fauchereau, Fernand Léger, Paris, 1994, no. 112 (illustrated in colour). G. Bauquier, Fernand Léger, Catalogue raisonné de l'oeuvre peint 1944-1948, Paris, 2000, no. 1306 (illustrated p. 229). Freiburg-im-Breisgau, Landesamt für Museen, Fernand Léger, 1949, no. 25. 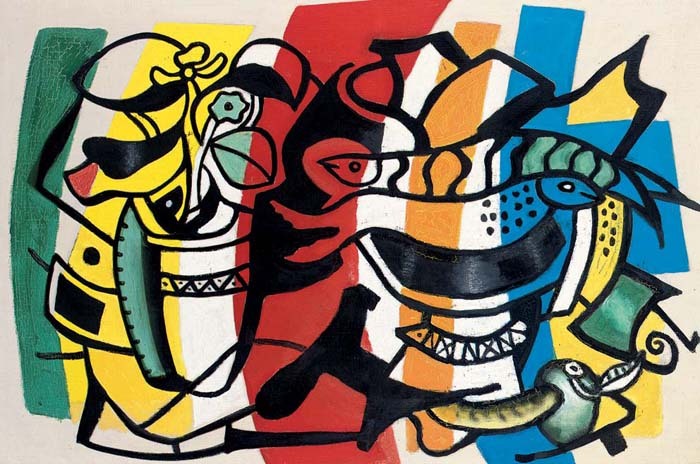 Hanover, Kestner Gesellschaft, Fernand Léger André Masson, 1949, no. 20. Paris, Galerie Louise Leiris, F. Léger, 55 oeuvres 1913-1953, 1985, no. 49 (illustrated in colour in the catalogue p. 56). Tokyo, Daimaru Museum, Hommage à Tériade, 1987-1988 (illustrated in the catalogue p. 28); this exhibition later travelled to Kiyoharu, Shirakaba Museum, Yamaguchi, Prefectural Museum, Osaka, Daimaru Museum and Nagoya, Aichi Prefectural Museum of Art. Basel, Galerie Beyeler, Fernand Léger, Werke 1925-1955, 1994 - 1995, no. 23 (illustrated in colour in the catalogue p. 34). 'The plastic life, the picture, is made up of harmonious relationships among volumes, lines and colours. These are the three forces that must govern works of art. If, in organizing these three essential elements harmoniously, one finds that objects, elements of reality, can enter into the composition, it may be better and give the work more richness. But they must be subordinated to the three essential elements mentioned above' (Léger, quoted in exh. cat., Fernand Léger, New York, 1998, p. 247). Although Léger had by this stage all but turned his back on the geometry and order that represented his visual expression of purism, he continued to juxtapose in his pictorial vocabulary recognisable objects with images of abstraction that often fulfil a more compositional role within the painting. These object-based but semi-abstract paintings often employ colour as an entirely separate compositional entity, unifying the elements within a pictorial space and, in the present work, creating contrasting planes of depth and direction. Thus Léger combines form and object into a new objective unity that he hoped would enhance the inherent beauty to be found in the modern everyday world. 'My aim is to try to lay down this notion: that there are no categories of Beauty - this is the worst possible error. The Beautiful is everywhere; perhaps more in the arrangement of saucepans in the white walls of your kitchen than in your eighteenth century living room or in the official museums' (F. Léger, The Machine Aesthetic: The Manufactured Object, the Artisan and the Artist, 1924). In keeping with this theory of the inherent dignity of objects, Léger therefore ascribes as much importance to minor objects that are depicted as to more noble inclusions. Each element is given equal status in the construction of the whole. 'In contemporary life if one looks twice, and this is an admirable thing to do, there is no longer anything of negligible value. Everything counts, everything competes and the scale of ordinary, conventional values is overturned' (F. Léger, The Machine Aesthetic II, Paris, 1925).